Spring time brings a natural explosion in the population of young rabbits. As a result, perhaps you have acquired a new pet rabbit of your own. If so, perhaps you’ll still have a few questions about how to best take care of your bunny. 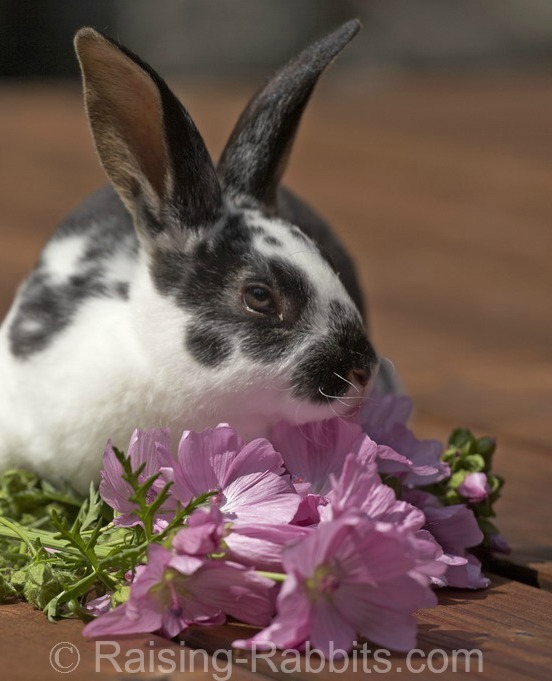 You'll find our New Pet Rabbit Checklist here. Below: Young pet bunnies resting after a romp outside in a rabbit run. Sometimes rabbit owners just need a little bit of rabbit information. 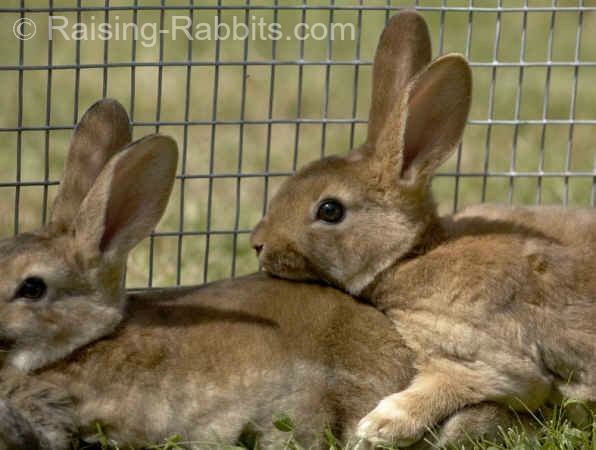 As Raising-Rabbits gets more and more visitors, we also get many more questions about various aspects of rabbit care. That makes us happy, of course! And very busy, too. Sometimes, if the answers are clearly spelled out on the website, we prioritize and answer the more difficult or less common questions. Via the Comment section on some pages. You can even hop over to our Facebook page and post there. Our goal is to empower you to successfully care for your rabbits, whether they are pet rabbits, meat rabbits, or show rabbits. We're certainly open to your ideas if you have noticed any opportunities for improvement. The following questions crossed my desk; I decided answering them here might also help others. I'll also include the link to the page where a more extensive explanation may be found. "Hi There is white paste on the bottom of my rabbit’s cage. Is this him peeing or is he sick or what is causing this? I feed him hay, mixed greens, and pellets." "Where are my rabbit’s babies? I found blood in the cage at day 29, and now it’s day 31, and there are no babies in sight! What happened? I'm new to all of this." It’s hard to say exactly what happened. Perhaps the doe will properly kindle in the next few days. It could also be she miscarried and ate the evidence. Whenever you are unsure what to do, always obtain the opinion of a rabbit-savvy vet. We know a lot of stuff about rabbits, but we’re not vets, and from here we can at best only surmise as to your rabbit’s circumstances. "Is it okay that my full grown bunny (6months, male) is mating with my baby bunny (1 month, female)? I don't know if it’s harmful to the baby bunny?" "We have our 3 rabbits on our screened-in (vinyl windows), tiled floor porch. We have a ceiling fan directly overhead and a floor fan but we are concerned about the humidity and heat once we get into July and August. Does anyone know how to make sure they don't get overheated?" Now is certainly the time to be planning ahead for the hot summer. And yes, we have quite a few ideas for you: Cooling Rabbits. A few of our ideas work best in a drier humidity; if you need to, you could locate rabbit breeders in your area and ask them how they deal with the heat coupled with your Florida humidity. "We noticed in the last week our buck, about 10 months old, will tilt his head and fall over on to his side. It is almost like he is falling over or fainting, then getting right back up. Why is causing him to do this?" Ugh. We hate hearing this for your sake and the rabbit's, sorry. You’ll need a vet’s assistance, as the two most likely diagnoses are Pasteurellosis infection extended to the middle and inner ear (or even the brain), or Nosema, a rabbit parasite infection. Both possibilities are unfortunate ones. I’d love it if I’m wrong. Seeking to Save Peter Cottontail from Extinction: In New England, conservationists are working hard to recreate dwindling habitat for the New England cottontail - a species of rabbit native to the Northeastern USA. In New Zealand, on the other hand, conservation workers are facing another problem - 2 feral rabbits recently spotted on an island near Christchurch. New Zealanders know only too well how quickly 2 rabbits can turn into 2 million, threatening the island’s plants and ecosystem. Conservationists hope to find and eradicate the rabbits. Early Test of Stem Cell Joint Repair: In highly intriguing news from the world of science, stem cell research in rabbits is yielding very promising results for arthritis sufferers. It could be one day that instead of a complete joint replacement, you might be able to re-grow your own cartilage or joint. When the time comes, it will be thanks to researchers and to rabbits! Your friends at Raising-Rabbits.com wish you a wonderful May 2013.